PrimeTrust Federal Credit Union. Sharing 80 years of service excellence with our communities. They know their members by name and the approach has not changed. You have a say in how your money works for you. They are the experts that help reach your financial goals. LEAP Managed IT is excited to spotlight our partners at PrimeTrust. Their Mission Statement and values are what they hold above everything else. Businesses talk about helping quality of life. PrimeTrust turns their mission into reality. Being member-owned and not-for-profit cooperatives, the focus is your financial success. PrimeTrust is owned and governed by it’s own members. Each loan originates from the deposits of members to co-members. The profit is reinvested in better rates and low-and-no-service fees. Equally important, is their goal to promote and assist communities. Thus raising up the quality of life of its members through financial assistance. They believe in creating a better place to live, work and raise families. The spirit of civic leadership is shared by the employees and members alike. Being around since 1935, PrimeTrust has experienced growth and changed with the times. Similarly, investing in their people, technology and most importantly their members. Hence, Leap Managed IT is proud to team up with PrimeTrust. Together, these two organizations continue to develop and grow. Both focus on serving their partners in better ways. Leap brings technological peace of mind to many partners. Because of being a financial institution, cyber security is always a top priority. Therefore, Leap developed a training program not just for PrimeTrust employees but also its members. Educating the community on the “do’s and don’ts'” of cyber security. As a result, Leap is proud of being able to serve the financial community and share IT Best Practices with its members. When two experts work together, nothing becomes impossible. 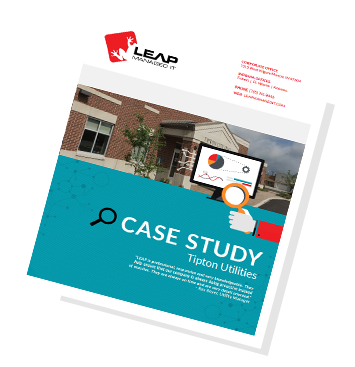 While PrimeTrust manages the finances of over 16,500 people today, Leap Managed IT focuses on a tailored IT Master Plan. It benefits both small and medium enterprises. Visit www.primetrustcu.com to learn more about membership benefits. To learn more about an IT Master Plan visit leapmanagedit.com.